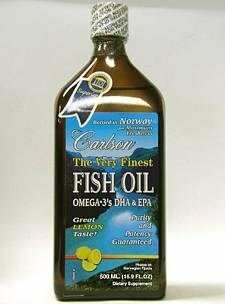 Carlson Laboratories Carlson The Very Finest Fish Oil Liquid Omega-3 Lemon, 500Ml. Very Finest Fish Oil Lemon Flavor by Carlson Laboratories 500 ml Liquid The Very Finest Fish Oil comes from deep cold ocean-water fish. It is processed and bottled in Norway to ensure maximum freshness. Take by the teaspoonful mix with foods try it on salads It has a refreshing lemon taste. THIS PRODUCT is regularly tested (using AOAC international protocols) for freshness potency and purity by an independent FDA-registered laboratory and has been determined to be fresh fully potent and free of detectable levels of mercury cadmium lead PCB’s and 28 other contaminants.